At FiveOax Bathroom, Plumbing and Heating we provide you with exceptional quality and exceptional value. You don't have to take our word for it just read what past customers say about us on our testimonials page. We are always available on the phone or via immediate call back, and because most of the time you'll be dealing with Sue or John (the owners) you know you are going to experience a first class service. We offer a service tailored to your needs, including supply and fit or fit only as you require. We take pride in doing a good job and we are proud of our business. Our business has been built on personal recommendations and we will always endeavour to maintain our high standards.. When you ask us to do a job for you, however large or small, we will try to cause as little disruption as possible. 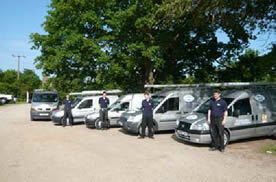 Our engineers all work from fully fitted, smart, sign written vans and will be wearing a FiveOax uniform. We always lay dust sheets and move any furniture if required. We believe in exceptional customer service and look forward to being of service to you in the very near future. ©2011 All rights reserved Five Oax Ltd.